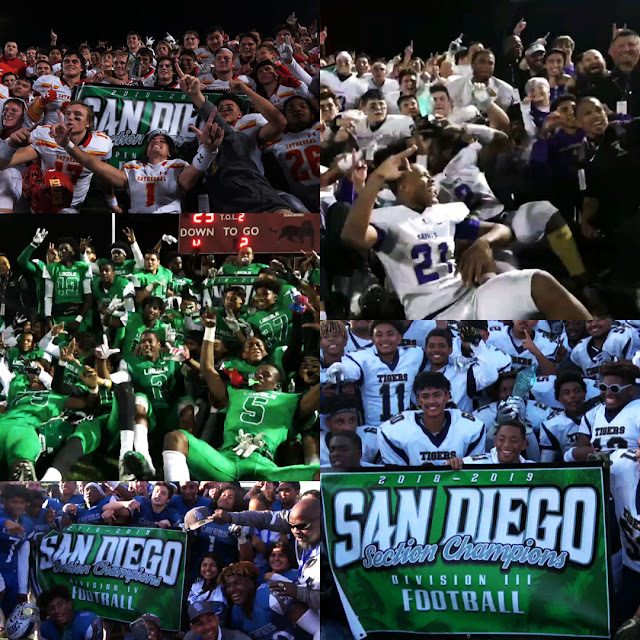 City Conference teams dominated the 2018 CIF San Diego Section Championship by claiming five of its six 11-man titles. Winners of the top three divisions came from the Western League (Cathedral, St. Augustine, & Lincoln), while Orange Glen represented the North County as its only champion. We would like to congratulate 8-man champion Foothills Christian, and the six teams who advances to the CIF State Playoffs. Shawn Poma rushed for 178 yards and scored three times to help Cathedral Catholic defeat top-seeded Torrey Pines. In a losing effort, Mac Bingham rushed for 120 yards and the first two touchdowns of the game for the Falcons. The Falcons answered back with Ted Merrifield's 36-yard field goal to extend their lead to 17-7, but DJ Ralph would find Zion Sorani for a toe-tapping four-yard strike to cut it to 17-14 at halftime. After a brief defensive struggle for both teams, Poma's two-yard goal line dive gave Cathedral a 21-17 lead with 4:34 left in the third quarter, and they never looked back. The 2018 CIF San Diego Championships ended with St. Augustine winning the Division I title in a stunning fashion. Helix answered St. Augustine's overtime touchdown with a razzle-dazzle pass from Tim Christopher to Chris Rivera, but a botched snap while attempting a game-winning two-point conversion gave the Saints the win. Byron Cardwell rushed for 74 yards and 2 touchdowns for the Saints. Helix junior Elelyon Noa rushed for 146 yards and the first score of the game. Carlito Nothaft rushed for 66 yards and the game-clinching touchdowns to help Lincoln win its first CIF title since 2012. The Hornets' defense swarmed all over Mira Mesa, keeping their explosive offense out of the end zone despite defending the ball in their own territory at the start of multiple possessions. Akili Butler had an outstanding performance, recording six sacks and a safety. Morse joins Lincoln in bringing a CIF Section Championship to Southeast San Diego after handing Central its first and only loss of the season. Isiah Thompson rushed for 166 yards and two touchdowns to help the Tigers clinch its first title since 1994, when a John Shacklett led group knocked off Ricky Williams' Patrick Henry squad. Shamar Martin chipped in with 21 carries for 105 yards. Five different players found the end zone for the Cavers as they rolled past Kearny to clinch its first CIF Section title since 1969. Ethan Villalobos threw two touchdown passes to help lead Orange Glen to its first CIF Championship since 1967. Patriots standout Cael Patterson had 33 carries for 236 yards and a score, along with a 9-yard touchdown catch. The defense contributed to the scoreboard with two interceptions returned for touchdowns. The Knights earned their second 8-man section title in the program's 13-year history after beating San Diego Jewish in a rematch of their regular-season contest. This is also the second championship in three seasons under head coach Joe Mackey.